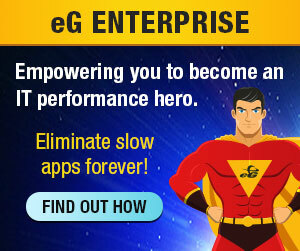 eG Innovations today announced a newly restructured channel partner program for North America, offering compelling partnership benefits that enable enterprise technology service providers to easily and profitably add end-to-end IT performance monitoring to their customers’ technology portfolios. The new program is designed around a matrix of sales and marketing value that drives winning channel partnerships: great margins, co-marketing programs, hands-on training, free NFR software access, and more. With multiple levels of partnership, value-adds and aggressive incentives for high volume, eG Innovations is focusing on adaptability and partner-friendly terms to help drive wins for solution providers who sell solutions for today’s largest IT deployments around virtualized desktops and applications, enterprise applications and web applications. The eG Partner program also includes discount incentives to partners who offer the eG Enterprise product suite as a SaaS offering to their clients. The company also announced that five US solution providers joined the new eG Partner Program during the pre-launch phase of the new program: Gotham Technology Group, Applications2U, CSPi, Convergence Technology Consulting, and LanStatus.